Jaguar F-TYPE 400 SPORT special edition. One year only: 2018 Jaguar F-TYPE 400 SPORT. 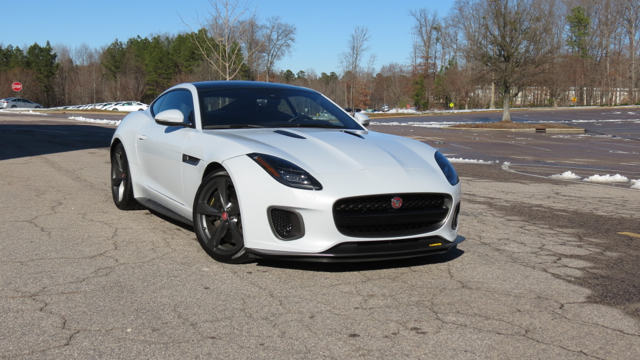 The Jaguar F-TYPE is more attainable than before, thanks to an all-new base turbocharged four-cylinder engine. With a starting price of about $60,000, you can get behind the wheel of one of the most beautiful sports cars of our day. On the other hand, there is another new model that should spark interest amongst F-TYPE aficionados — the 400 SPORT. Available only for the 2018 model year, this one comes with the familiar 3.0-liter supercharged V6 engine powering most other models, but there is a twist: it’s optimized to deliver an even 400 horsepower — 60 more stallion than the base configuration and yet 20 more horses than the enhanced R-Dynamic edition. 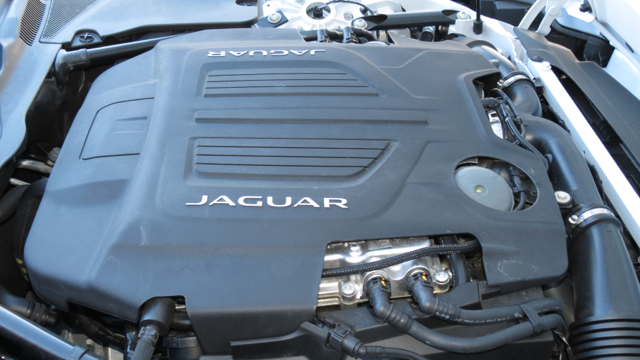 Jaguar pairs this engine with an 8-speed automatic with paddle shifters. Customers have a choice of a coupe or a convertible and rear- or all-wheel drive. 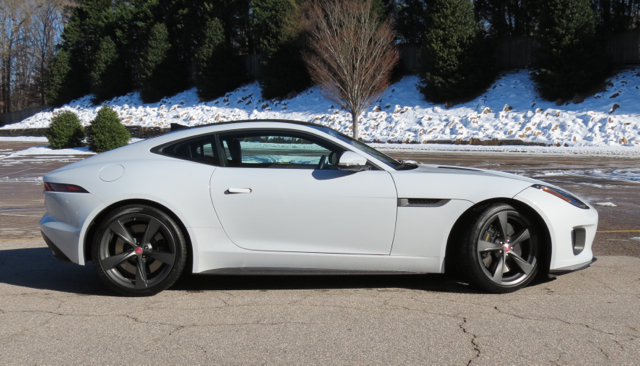 I had the good fortune of driving a rear-wheel drive 2018 Jaguar F-TYPE 400 SPORT for a week, my weekly conveyance arriving just after the biggest snow accumulation to strike my area in seven years began to melt away. By the weekend, most local roads were clear and my driving options widened considerably. Before we dig deeper, let’s take a brief look at Jaguar’s history — in particular, its sporty models. Critics recognize the F-TYPE as the spiritual successor of the handsome E-TYPE (1961 to 1975) and it is safe to say that the design elements of the earlier model, such as the long hood carry over. In between the two “types” were the XJ-S followed by the XK. Go further back to 1935 and you’ll find the company’s first open top two-door coupe, the SS90. Other than wartime interruption, Jaguar (SS Cars Ltd. until 1945) has delivered a continuous string of two-door coupes/sports cars available. Why is this important? Because as much as Jaguar has evolved in recent years (they now sell not one, but two SUVs…gasp! ), the company isn’t about to forget its roots. Heritage is a guiding principle with JLR (Jaguar Land Rover), but so is innovation. Blend the two and its current product line mix of sedans, utility vehicles and a sports car makes sense. This year, you’ll even find the XF Sportbrake, a wagon. A pure electric vehicle (I-PACE) is in the planning stages. As for the model at hand, Jaguar sold 4,108 F-TYPEs in the United States in 2017. If that doesn’t sound like much, consider that it outsold such competitors as the Mercedes-Benz SLC-Class, Audi TT, Porsche Cayman, Porsche Boxster and the Alfa Romeo 4C. Definitely, this is a niche segment. Of the pack, the F-TYPE was the only one to register a sales gain for the year. That says a lot in a market where utility vehicles continue to hold sway. So, what’s so special about the 400 SPORT other than its brief appearance? For starters, the model brings something different to the product line for enthusiasts to consider. Although the 400 SPORT is like the other trims, its enhanced powertrain is exclusive to it. In the Jaguar pecking order, performance numbers receive special attention, even if the differences are seemingly small. Yet, the changes go well beyond horsepower to include such elements as a Sport Design Package (front splitter and rear diffuser) with dark satin grey and gloss black accents, black brake calipers with yellow 400 SPORT script, unique 20-inch dark satin grey alloy wheels and special 400 SPORT branding in yellow fixed to the front and rear bumpers. The color scheme embellishments limit this model to just three patinas, but they’re metallic: Yulong White, Indus Silver and Santorini Black. Other enhancements include 380 mm (14.96 inches) brakes up front and 376 mm (14.8 inches) at the rear, adaptive drive dynamics and a configurable dynamic mode. Inside, you’ll find exclusive performance seats with special bolstering and embroidered headrests. 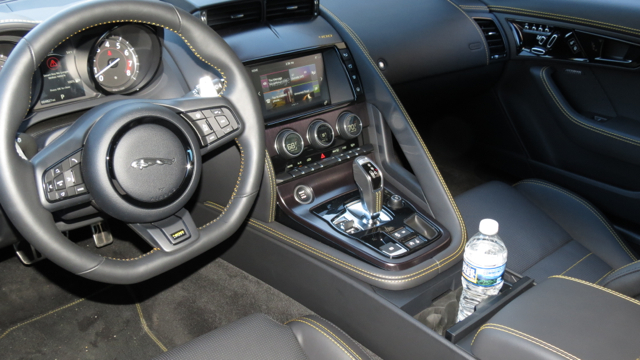 Jaguar dishes out the eye candy with the twin yellow stitching on the seats, across the dashboard and surrounding the thickly padded steering wheel. Other details include the stamped tread plates as well as the badges found on the bottom of the flat-bottom steering wheel and console finisher. That’s just enough “pop” to capture your attention, but not to the point of distraction. 1) The Jaguar isn’t as difficult to access as you might think. Thus, egress doesn’t mean leaning over to make your exit. 2) The seats are just as comfortable as they’re bolstered. One concern I have about performance models are seats that don’t supply even support across the back. Even if you only occasionally experience lower back pain, the seats can make or break your driving experience. Happily, the 400 SPORT’s seats were firm, yet comfortable and bolstered, but not exaggerated. Press the ignition button and immediately the 400 SPORT roars to life. The active exhaust system is a hoot, especially when idling. Press hard on the accelerator and the exhaust system sends a rapidly growing rumble through the pipes before booming out the back. You’ll get this same experience while driving, especially as you let up on the gas pedal and naturally slow down. All that built up back pressure wants a release, then delivers a sweet tone when it does. I’m not one to diminish the finer attributes of a V8, especially the boosted engine powering some F-TYPE trims. Having access to an amazing amount of power in a small vehicle is a mind-blowing experience. The supercharged V6 powering the 400 SPORT is more than sufficient, however, rocketing this sports car from 0-60 mph in under five seconds. Keep an eye on your rearview mirror as you climb to highway speeds and beyond for at 70 mph the active rear spoiler automatically rises into place and stays up until your speed falls below 50 mph or when you stop. My only concern here is that watching law enforcement will see its rise as visible proof you’re going too fast, so use caution here. 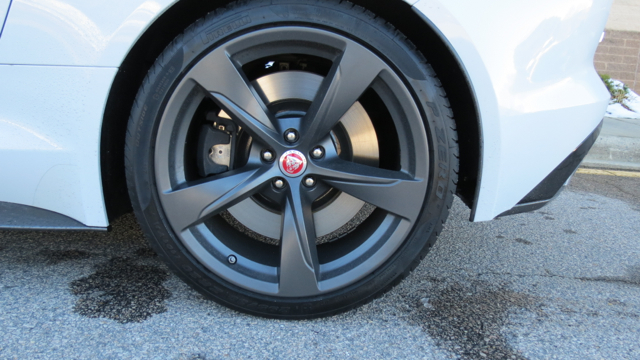 The F-TYPE offers outstanding steering and handling. Most times, you’ll feel firmly planted to the pavement. Familiarize yourself with the configurable drive mode switch, which controls steering, shifting, throttle and shock damping. Find your sweet spot and enjoy. 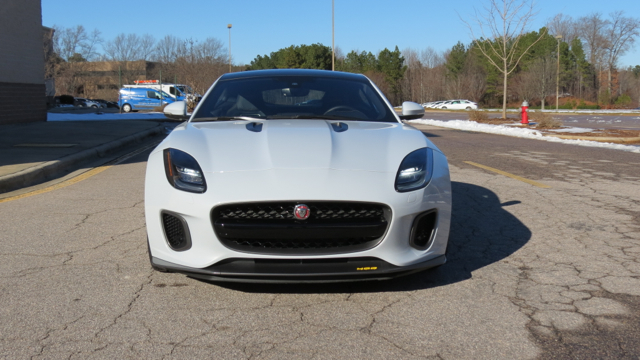 All in all, the F-TYPE is forgiving and uplifting — you’ll feel like a professional driver as you press into every curve and come out of it with your heart pounding, a silly grin fixed to your face and thoughts of tackling the next curve racing through your mind. If there is one drawback it would be the lack of a manual gearbox for rear-wheel drive versions. That said, switching to sport mode and using the paddle shifters supplies a generous measure of fun. There are many finer points about the Jaguar F-TYPE that could take up a brochure. In any case, my test model came with a panoramic roof, ideal for bringing in light or enjoying a starlit winter’s night as I did. Speaking about the night, my test model came with special LED “J” blade daytime running lights. The headlights adapt the width and depth of their beam to your speed, ensuring optimal illumination whatever your surroundings. They’re also better for helping drivers distinguish objects and reducing fatigue. Although I kept nearly all my drive time to daylight hours, when I did venture out during low-light hours, they were immensely helpful. Upgrades are many and include an Extended Leather Package ($2,245, leather headliner and leather-wrapped visors), a Suede Cloth Upper Environment Package ($970, suede headliner and suede-wrapped visors), a Climate Package 2 ($1,430, heated windshield, heated seats and dual-zone climate control), and a Carbon Ceramic Brake Package with Forged Wheel Package ($12,240, 20-inch 5 split-spoke wheels in metallic black finish along with front and rear carbon ceramic brakes with yellow brake calipers). Individual upgrades include a Meridian surround sound audio system ($870), power tailgate ($410) and automatic dimming and power folding heated side mirrors ($185). Play around with the Configurator and you could add $20,000 to your price, bringing your final cost to just over $109,000. The good news about the 400 SPORT is that Jaguar hasn’t set a quota on the number of the trims it will build. The bad news, of course, is that you have only one model year to purchase one. That said, owning a limited edition model is a collector’s dream if you’re into that sort of thing. 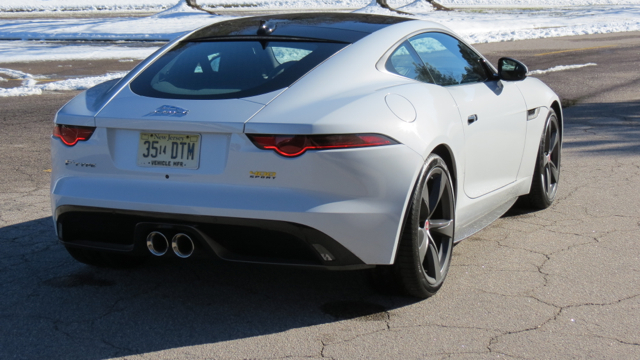 In summation, the F-TYPE — no matter the garb — delivers a generous amount of fun as well as admiration from people you meet. Furthermore, I lean toward the convertible and a six-speed manual gearbox, one of 20 build options (10 each coupe and convertible) available this model year for Jaguar’s exemplary sports car.